This month we’re seeing red . . . (and orange) . . . American Indian jewelry. Our newest thematic presentation is on one of the most revered colors in Southwestern American Indian jewelry and two materials (Coral and Spondylus Shell) used to create that jewelry in all shades red. Spondylus shell or spiny oyster comes from the Gulf of Mexico & South America. It can be found in purple, yellow, red, and orange hues, and has been used in bead making by Native Americans even in pre-historic times. Therefore, upon first contact with the Europeans, Native Americans already had a standing tradition of hand shaping red and orange spondylus shell into beads. It is no surprise, then, that when Europeans introduced red coral harvested from the Mediterranean Sea to the Native Americans, it, too, became a prized material for adornment. Navajo, Hopi and Pueblo people adeptly hand-ground, hand-cut, and hand-drilled this coral into regularly shaped beads that were readily adopted into their jewelry making. In fact, we know that the Hopi wore coral necklaces in the 1870’s and 1880’s at their snake dances. Among the 20th century Zuni, we credit trader C.G. Wallace with doing much to stimulate the use of natural Mediterranean coral among Zuni jewelers like Leekya Deyuse and Dan Simplicio. That is, until World War II, when it became difficult to import Mediterranean from Italy, an enemy of the United States. 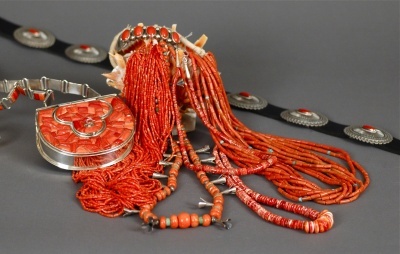 During the Second World War, when new supplies of Mediterranean coral were no longer available, American Indian jewelers returned to using spondylus shell to complete their red and orange jewelry. After the war, Mediterranean coral could be obtained again, but the supply, once believed to be inexhaustible, was soon greatly depleted due to over-harvesting and pollution. Today, it is very difficult to obtain high quality Mediterranean coral. It is very rare and very valuable, indeed. Unless it is taken from older supplies, most of the coral used today comes from Japan and Australia. There is also, of course, “fake” coral, which is either poor grade coral dyed to be redder in color or glass beads. 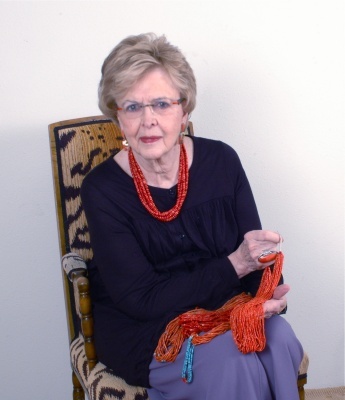 In discussing fine coral, Marti Struever recalls how in the 1970’s, one could go into an American Indian pawnshop and see rows of natural Mediterranean coral necklaces for sale, but now the pawn vaults, hold a much smaller number. As this resource gets more and more rare, values will only continue to go up. The Native American people consider coral a sign of wealth and status - the more strands in your coral necklace, the better. Inheritance might even be passed down in coral. When you look at early multi-strand coral necklaces, it becomes evident that the wearer added strands of coral as they were able, as their wealth or social standing grew. Once, American Indian artist, Mary Rosetta brought out a few shoeboxes of her “private coral” for Marti Struever to admire; this was the equivalent of her savings account.